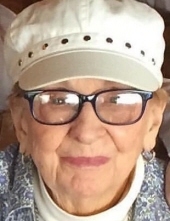 Plant a tree in memory of Virginia "Ginny"
Virginia Brock Walsh died on April 2, 2019 in Poughkeepsie, NY at the age of 98. Beloved wife of Maurice Charles Walsh, who predeceased her in 2000, Virginia had a long and accomplished life in the Hudson Valley. She was married to Maurice in 1941 and raised four children, Michael, Robin, Brock, and Rebecca who survive her. A fifth child, Timothy, died in infancy. She is also survived by nine grandchildren and eight great-grandchildren. A graduate of Poughkeepsie High School in 1938, Virginia was as brilliant as she was beautiful. She enrolled at Vassar Brothers Hospital School of Nursing and, upon graduation, quickly distinguished herself as caregiver and counselor for a multitude of grade school students at Holy Trinity and St. Martin de Porres schools. She was as skilled with a contusion as she was with hurts of a more emotional nature, ably tending to both in her office daily. Her decades of care brought her in contact with former students raising children of their own. Virginia and Maurice settled in Red Oaks Mill in the Town of Poughkeepsie. There they created a home of thriving children, still making room for a stream of foster children who shared in backyard games and chaotic dinner tables. Long time members of the Dutch Reformed Church in the City of Poughkeepsie, they lived their philanthropy. The north star's your night light, it shines on your bed . . .
After their retirement, Ginny and Maury, as they were known to all, opened a bed and breakfast in Henniker, NH, called Hanscom House. Ginny's baking and Maury's gregariousness led to many satisfied smiles on the faces of snowbound travelers. Marveling at her approaching centenarian status, Virginia Walsh never lost her love of family, gardening, great books, and The New York Times. Anyone on the opposing side of a political argument either came prepared or exited outmatched. She became a resident of Woodland Pond in 2011, endearing herself to many. Mohonk rising on the western horizon, she hosted her children and grand-children there often. Not one of them will ever encounter the aroma of freshly baked bread without thinking of their mom and their Nana. She lives in our hearts. A memorial service will be held Friday, April 19th at 1pm at Woodland Pond, 100 Woodland Pond Cir, New Paltz, NY 12561. A reception will follow at the same address. To plant a tree in memory of Virginia "Ginny" Brock Walsh, please visit our Tribute Store. "Email Address" would like to share the life celebration of Virginia "Ginny" Brock Walsh. Click on the "link" to go to share a favorite memory or leave a condolence message for the family.